WASHINGTON (CNN) -- Are you ready yet? 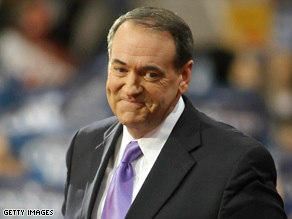 Mike Huckabee comes out on top in a poll of support for potential 2012 GOP presidential hopefuls. Barack Obama is more than six weeks away from assuming the presidency, and the next Iowa caucuses are more than three years away, but a national poll out Friday suggests that former Arkansas Gov. Mike Huckabee and Alaska Gov. Sarah Palin top the list of potential 2012 Republican presidential hopefuls. Huckabee leads in the CNN/Opinion Research Corp. poll released Friday. The survey is an early measure of possible support for the next GOP presidential nomination. Thirty-four percent of Republicans and independents who lean toward the GOP said they are very likely to support the former Arkansas governor as the Republican nominee in 2012. Huckabee surprised many by winning this year's Republican Iowa caucuses and seven other contests before dropping out of the race in March and backing Sen. John McCain. Palin, McCain's running mate, is 2 percentage points behind Huckabee, at 32 percent. Considering the survey's sampling error of plus or minus 4.5 percentage points, Palin and Huckabee are basically tied. "It might come as a surprise to some that Palin does better than Huckabee among GOP men, but that Huckabee beats Palin among Republican women. Palin's strength is also concentrated among older Republicans, but Huckabee may have a slight edge among conservative Republicans," said Keating Holland, CNN's polling director. Among voters who consider themselves born again or evangelicals, Huckabee holds a 9-percentage point lead over Palin, with the Alaska governor ahead by 7 points among those not in that group. Former Massachusetts Gov. Mitt Romney is in third place in the poll, with 28 percent of those questioned saying they are very likely to support him as the GOP nominee in 2012. Romney gave up his bid for the White House in February and backed McCain. Former House Speaker Newt Gingrich is 1 percentage point behind Romney, at 27 percent. In 2007, Gingrich flirted with making a stab at the Republican nomination but decided against jumping into the race. Twenty-three percent said they would be very likely to support former New York Mayor Rudy Giuliani if he decides to run again. Giuliani was the front-runner in many polls in late 2007 before performing poorly in the early primaries and caucuses. He dropped out of the race for the White House in January and immediately backed McCain. Louisiana Gov. Bobby Jindal, who's considered a rising star in the GOP, grabs the backing of 19 percent, with Florida Gov. Charlie Crist at 7 percent. "Jindal and Crist are relative unknowns. The fact that they get much less support than the others is likely a function of name recognition rather than a true measure of their potential base of support," Holland said.